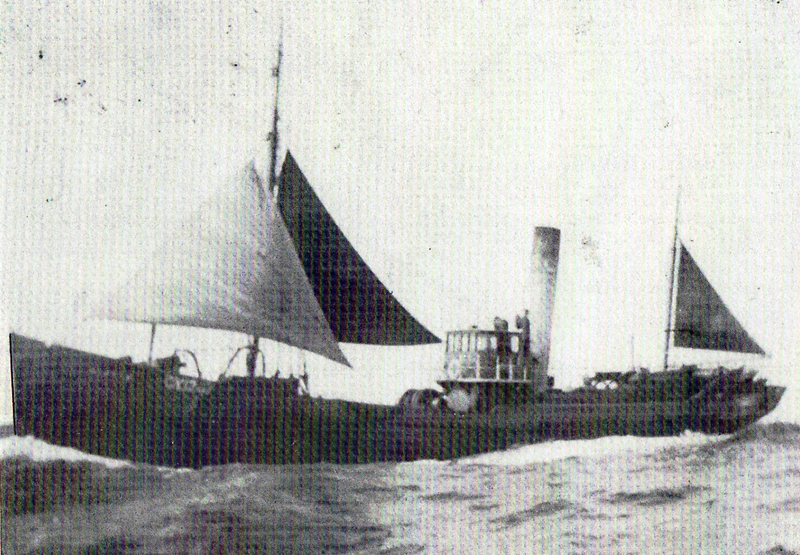 3.2.1909: Launched by Smith’s Dock Co Ltd, North Shields (Yd.No.401) for The “Wyre” Steam Trawling Co Ltd, Fleetwood as SULBY. 9.3.1909: Registered at Fleetwood (FD87). 3.1909: Completed (Richard C. Ward & John N. Ward, joint managers). 1910: John N. Ward appointed manager. 10.2.1912: Stranded 3 miles N of Ramsey (Sk. Fairclough); ten crew. Refloated and returned to service. 1912: Magnus B. J. Wedum appointed manager. 8.1914: Requisitioned for war service as a minesweeper (1-6pdr) (Ad.No.131). 13.3.1926: Sold to George Hindle, Wilpshire, Lancs (Joseph A. Taylor, Albert V. Thompson & Harold Taylor joint managers). 16.2.1931: Sold to Islay Trawlers Ltd, Fleetwood (Henry Melling, manager). 10.3.1931: Sold to Cape Fisheries Ltd, London (Albert V. Thompson, Fleetwood, manager). 5.7.1932: Sold to Alexander Keay, Fleetwood & Andrew Wilson, Buckie (Alexander Keay managing owner). 18.3.1933: Sold to Alexander Keay, Fleetwood (managing owner). 25.4.1933: Homeward from West of Scotland grounds, stranded at Strongarve, 4 miles N of Mull of Kintyre. Glasgow steamer LOCHIEL (318g/1906) and Southend lifeboat standing by. At 3.00 pm. refloated and after checks, proceeded to Fleetwood. 21.11.1939: On fishing grounds 35 miles NW of Rathlin Island (Sk. Clarence H. Hudson), eleven crew (in company with CUIRASS (GY436) and William HUMPHRIES (LO533)). At 8.00 a.m. stopped by by U-boat (U.33) with warning shot, crew abandoned in two boats, but shelled while lowering port boat. Sunk by gunfire, five rounds from deck gun, in approx position 55.27N – 08.01W. In gale force winds, boat with Skipper and four crew never seen again. 23.11.1939: After 381/2 hours in open boat (H. Blackburn, bosun) made a landfall at Tobermory and picked up by Tobermory lifeboat. 28.11.1939: Fleetwood registry closed “Sunk by German Submarine”. (Survivors – H. Blackburn, Bosun; J. Geddes; H.G. Hay; A. Lewis; J. Threlfall, S. Melhuish and F. Brunt. 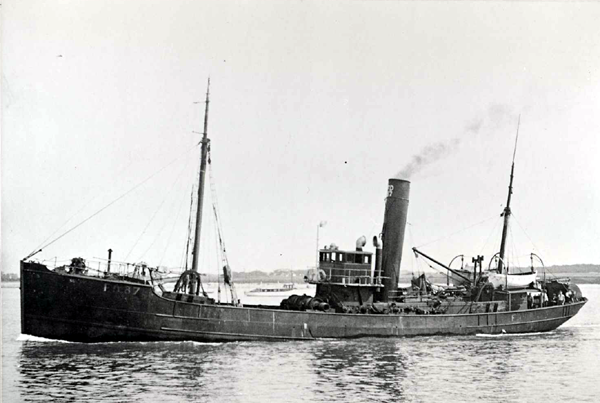 This entry was posted in Lost Vessels, Steam Trawlers, Steamers (Picture), War Losses and tagged Alex Keay, Islay Trawlers, Lost, War Loss, Wyre on January 14, 2009 by Fred Smith. 3.2.1909: Launched by Smith’s Dock Co Ltd, North Shields (Yd.No.388) for their own account – Smith’s Dock Co Ltd, South (sic) Shields as NUNTHORPE HALL. 2.4.1909: Registered at North Shields (SN90). 4.1909: Completed. Sold to The Admiralty. 26.4.1909: North Shields registry closed “Ceased fishing”. Fitted out as a minesweeper and renamed HMS SEAMEW (Ad.No.2). Based at Portland for minesweeping trials. 1914: Based at Chatham/Sheerness training fishery reserve crews (RNR(T) section personnel). 4.5.1920: Sold by auction at Milford to Edward D. W. Lawford, Milford Haven for £5000. 8.1920: Sold to Colin M. Mason, Cardiff (Atlantic Trawlers Ltd). 13.8.1920: Registered at London (LO393). 25.10.1925: George Hindle, Wilpshire, Lancs (Joseph A. Taylor, Harold Taylor & Albert V. Thompson, managers). 9.12.1925: Registered at Fleetwood (FD78). 1930: Sold to Ephraim H. Hindle, Wilpshire, Lancs. 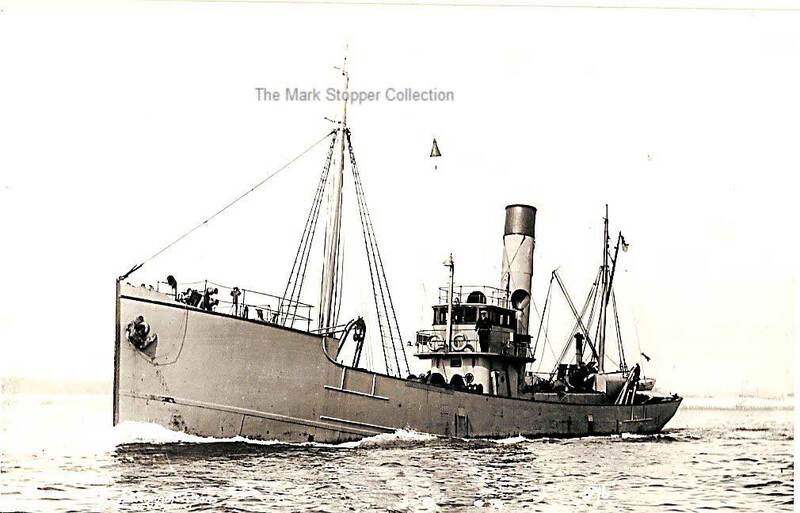 7.3.1931: Sold to Cape Fisheries Ltd, London (Arthur V. Thompson, Fleetwood, manager). 1934: Sold to Norwegian owners for conversion to dry cargo. 1934: fitted out to dry cargo. 19?? : fitted out for trawling. 1945: Lengthened to 40,79m (133.8 ft) 230g 105n. 19?? : Re-engined with 600bhp 8-cyl oil engine by La Maquinista Terrestre y Mar (MTM), Barcelona. 01/01/2009: page published. 4 updates since then. 30/10/2017: Removed FMHT watermark from image. This entry was posted in Steam Trawlers, Steamers (Picture) and tagged George Hindle, Islay Trawlers on January 1, 2009 by Fred Smith. 1903: Launched by G. Cooper, Hull (Yd.No.9) for Crown Steam Fishing Co Ltd, Grimsby as SCEPTRE. 27.2.1903: Registered at Grimsby (GY1262). 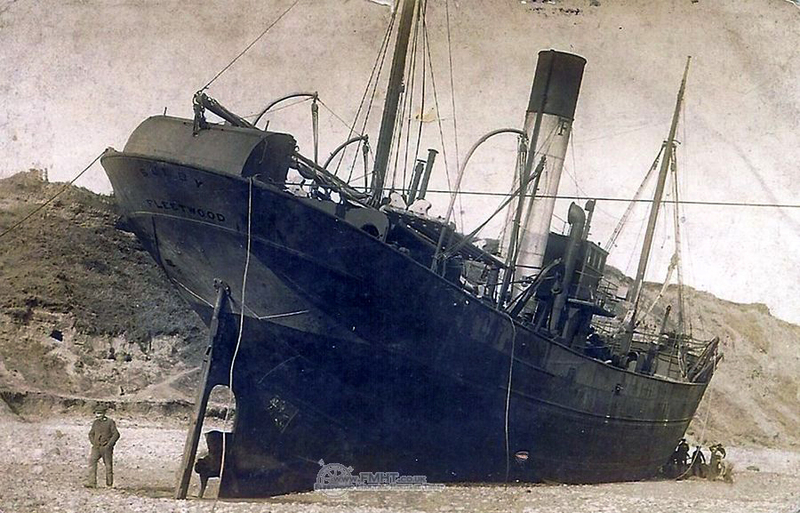 1908: Sold to Dublin Steam Trawling Co Ltd, Dublin (Arthur Richardson, manager). 8.1910: Registered at Dublin as EDMUND BURKE (D82). 1.1.1914: Tonnage altered to 84net under provision of Merchant Shipping Act 1907. 1922: Company restructured as Dublin Trawling, Ice & Cold Storage Co Ltd, Dublin (Arthur Richardson, manager). 1927: Sold to Mrs J. M. F. A. Nierinck, Blackpool. 8.1927: Sold to Islay Trawlers Ltd, Fleetwood (Joseph A. Taylor & Albert V. Thompson, joint managers). 12.8.1927: Registered at Fleetwood (FD156). 19.9.1931: Sold to Alexander Pirie Snr, Alexander Pirie Jnr, Gary Pirie & James Pirie, Aberdeen (Albert V. Thompson, Fleetwood, manager). 26.5.1934: Registered at Aberdeen as GRATEFUL (A213). 1940: Sold to Boston Deep Sea Fishing & Ice Co Ltd, Fleetwood (Basil A. Parkes, manager). 1942: Sold to Milford Fisheries Ltd, Milford Haven (Owen W. Limbrick, manager). 1945: Sold to James Mowatt, Aberdeen (managing owner). 1946: Sold to Grateful Steam Fishing Co Ltd, Aberdeen (James Mowatt, manager). 1952: Sold to BISCO and allocated to Malcolm Brechin, Granton for breaking up. 14.11.1952: Arrived Granton from Aberdeen under own power. 19/12/2008: Page published. 5 updates since then. 19/03/2018: Removed FMHT watermark from image. This entry was posted in Steam Trawlers, Steamers (Picture) and tagged Islay Trawlers, Mrs J Nierinck on December 19, 2008 by Fred Smith.